We are back with another edition of our Father's Day gift guide! 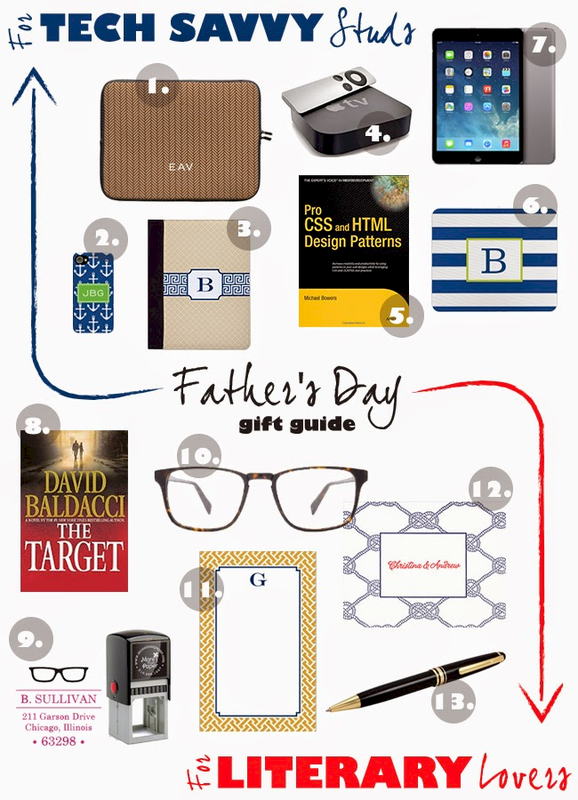 Today we have gifts for Dad who are tech savvy or literary lovers! What's your Dad's style? Choose from these great gifts, shop all these ideas! For the tech savvy Dad, try a (1) laptop sleeve by Boatman Geller or (2) nautical cell phone case also by Boatman Geller. We love this trendy yet (3) classic iPad case by Boatman Geller, as well, perfect for Dad who has his iPad on the go and needs to protect it in style. You really can't go wrong with (4) Apple TV, an educational (5) CSS/HTML book, or an (6) iPad mini itself. Lastly for the techie, we have (7) monogram and personalized mousepads that Dad is sure to love on his desk. When it comes to the "literary lover Dad", More Than Paper has a great selection of gifts and ideas. Choose from a best seller like (8) The Target, or a (9) geek-style address stamp from More Than Paper. We also love these (10) glasses, this (11) initial note pad by Boatman Geller, (12) personalized letterpress stationery also by Boatman Geller, or a (13) luxurious pen. So what gifts will you choose for Dad this year? What's his style? We'd love to hear what your favorite ideas are!